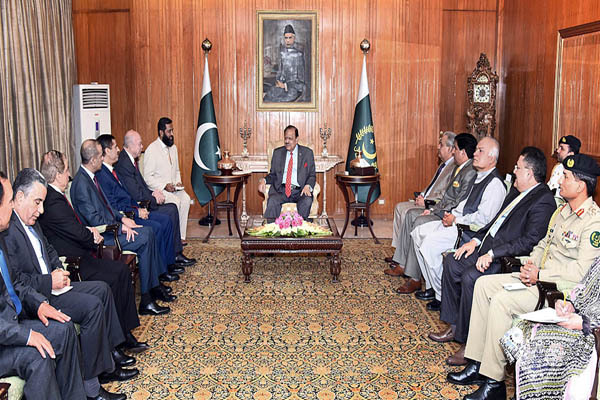 ISLAMABAD, Apr 25 (APP): President Mamnoon Hussain Tuesday emphasized upon transforming friendly traditional relations between Pakistan and Jordan into strong economic partnership to the mutual benefit of two countries. He said that Pakistan and Jordan enjoyed close brotherly relations embedded in shared history, beliefs and culture. The President was talking to Faisal Akef El-Fayez, President of the Senate of Jordan who along-with a delegation called on him at the Aiwan-e-Sadr, said a press release here. Chairman Senate Mian Raza Rabbani and ambassador of Jordan Nawaf Khalifeh Saraireh were also present on the occasion. The President said that Pakistan accorded great importance to its relations with Jordan and welcomed the cooperation that both countries extended to each other at regional and international fora. He said that Pakistan offered profitable opportunities for investment in its various sectors and called upon Jordanian entrepreneurs to benefit from it. He said private sector of Pakistan was keen to invest in Jordan, adding that the latter could benefit from Pakistan’s expertise in developing its textile sector. The President stressed upon utilizing the platform of Organization of Islamic Cooperation (OIC) to forge unity among Muslim Ummah and to address challenges being confronted by it. Mamnoon Hussain appreciated that the government and people of Jordan had always stood by Pakistan in the difficult times. He lauded the Jordanian government for providing shelter to hapless refugees of Syria. The President expressed gratitude that Jordan had assured of its support to Pakistan for memberships of Human Rights Council of United Nations, Board of Governors of International Energy Agency, International Telecommunication Unit and Economic and Social Council. He said each year under Pakistan Technical Assistance Programme, Pakistan allocated 31 seats for Jordanian students in different educational institutions in the fields of pharmacy, dentistry and engineering. He hoped that these students would play a role of bridge to bring the two countries further closer. The President said there should be regular exchange of cultural, educational and trade delegations between the two countries to enhance people-to-people contacts. The President called for exploring avenues of cooperation to further enhance defense ties between the two countries and also appreciated the government of Jordan for providing F-16 aircrafts to Pakistan in 2015. President of the Senate of Jordan, Faisal Akef El-Fayez said that Jordan and Pakistan had strong bilateral relations and his country was keen to further expand cooperation in various fields. He said that Jordan wanted to benefit from Pakistan’s expertise in various sectors. He lauded the role and sacrifices of Pakistan in fight against terrorism and extremism and said the both countries shared mutual perception in rooting out this menace. The President expressed his best wishes for King Abdullah and also extended an invitation for him to visit Pakistan at his earliest convenience.